Today Nvidia introduced its new flagship desktop graphics processor, the GTX Titan. Inspired by the Nvidia Titan Supercomputer found in the Oak Ridge National Laboratory, the GTX Titan is the company's most powerful single-processor GPU chip to-date, boasting a staggering 2,688 CUDA cores with 6GB of GDDR5 memory. While the GTX Titan falls short of Nvidia's current top whack GPU the GTX 690, in terms of raw specs and compute power, it makes huge gains in efficiency. Even though the GTX 690 drives 3,072 CUDA cores between two on-board GPUs (1,536 cores-per-GPU), the GTX Titan's single GPU features over a thousand additional cores. Subsequently, the GTX Titan requires less power (250w vs. 300w), generates less heat, runs quieter, and can fit in the growing category of compact PCs, such as the iBuyPower Revolt. During a briefing, Nvidia showcased the GTX Titan in two unique scenarios — a full-sized desktop with a three-way SLI configuration and a single GPU housed in a nearly console-sized Falcon Tiki PC. For the full-sized desktop, Nvidia dropped three GTX Titans into a system to drive Battlefield 3 on ultra settings to three monitors for a total resolution of 5,760x1,080, while the Falcon Tiki PC was equipped with only one GPU. In either scenario, the GTX Titan was nearly inaudible, even as settings were progressively increased. 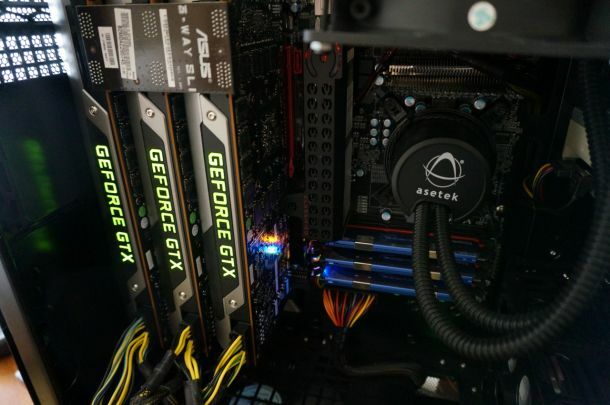 While the Titan's drivers will have pre-defined temperature and clock thresholds, Nvidia's latest GPU Booster software will let users prioritize performance over maintaining quiet operation. Nvidia is also unlocking the Titan so that users can drive even more performance outside of the max voltage, though at the risk of limiting the card's longevity. However, Nvidia is confident that so few users will be compelled to overclock the chip's voltage that doing so will not void your warranty. Nvidia will be offering the GTX Titan later this year for roughly $1,000. While roughly the same as the GTX 690, it's certainly targeted toward a niche market of premium PC builders.